Our free design service will help guide you in making the best decisions for your home. Our dedicated and knowledgeable staff will assist you through our large selection of quality products and explain the best options to fit your needs. Planning and space management is an important part of any home furnishings or garden decision. We take a great deal of pride in helping our customers make these decisions simpler. Our three step delivery inspection process makes sure you are satisfied right to the end of your purchase. The Arrowhead staff inspects each piece when it arrives to our store, again before your order is loaded on our own trucks and again before we bring your new items to your home. Once we arrive our staff will make sure each item is properly set up. Because we have our own delivery staff and trucks, we are able to provide local delivery to Nantucket and take care of a variety of unique situations. We offer a planting service for window boxes and planters. 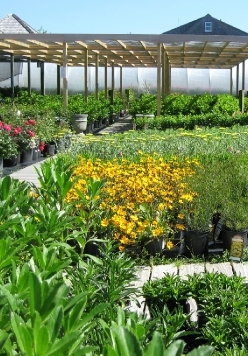 You can design your own and select the flowers from our three greenhouses, or give us a color scheme and we will create an arrangement you are sure to love. We also offer a planting service for trees and shrubs. A good value is more than just competitive pricing. At Arrowhead we strive to satisfy every customer from the time you enter our facility to the time we deliver your new furniture or plants to your home. Even after your delivery we are here to help answer any additional questions or concerns.